Cool Gear is definitely not just for kids! When I first mentioned Cool Gear a lot you guys said they only make kids products! Well I am here to let you know that is not true they make a lot of wonderful kids products but also many great adult products as well! Check out this amazing Stay Fit Deluxe Salad Kit! As most of my fans already know I pack my lunches any time I can because we eat healthy and eating healthy is somewhat hard away from home. This Stayfit Deluxe Salad Kit makes it pretty easy though! The kit has 3 different compartments and a lid; the first compartment is the bottom where you place your salad, the next compartment is made into 3 compartments for your different salad fixings, the 3rd compartment is a salad dressing holder for your dressing and then the lid of course to hold everything in. 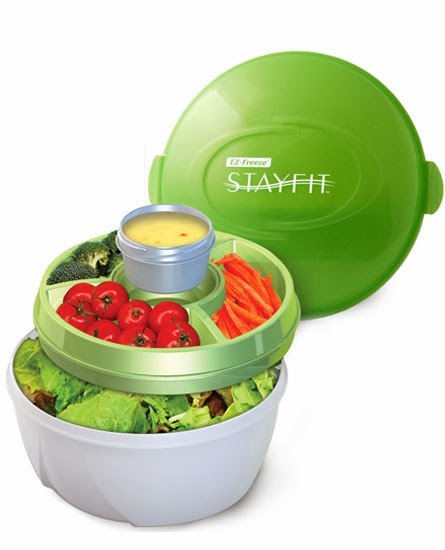 The Deluxe Salad Kit is very well made and the plastic is super heavy duty and sturdy. The Deluxe Salad Kit's features include snap tight tabs on lid, BPA FREE, dressing container snaps into tray, non-toxic freezer gel filled tray keeps your salad & dressings cold, salad bowl holds your favorite leafy greens and holds 6 1/4 cups (1.5 L), dressing container is 3.4 fl oz (100 mL) and gel tray (3 compartments) hold 2.7 fl oz (80 mL) each. This is perfect for the mom on the go looking to eat healthier whether you work and want to pack your lunch or just hate eating out all the time (like me) the Deluxe Salad Kit is perfect! I actually got to take my Cool Gear Deluxe Salad Kit on a test run on Sunday; I knew I would be out all day so I packed me a tasty Caesar Chicken Salad! Wow was I surprised at how well my Deluxe Salad Kit worked everything was perfectly in place when I opened the lid and my salad was just as fresh and tasty as when I packed it! That crispness of the salad is key for me I hate when salad turns ooey gooey I can't eat it! I am in love with my Salad Kit! To get your go to http://www.coolgearinc.com/stayfit/salad-kit.html. Also check out all of Cool Gear's products here http://www.coolgearinc.com/ and find Cool Gear on facebook here https://www.facebook.com/coolgearinc and twitter here https://twitter.com/CoolGearInc. Like and follow Cool Gear to keep up to date on all of their newest promotions don't miss out!